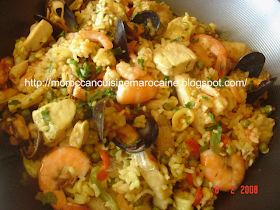 Moroccan Cuisine Marocaine: Authentic Moroccan Tagine! 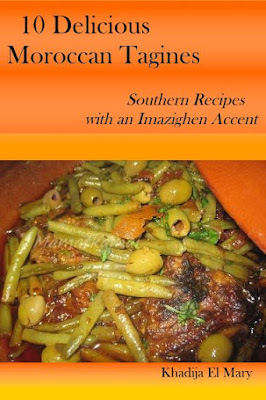 I am happy to announce that my first eBook about Moroccan tagine is ready. It includes 10 delicious tagine recipes, all from Souss region in the south of Morocco. I have just realised that the process of writing an ebook itself takes longer than expected because I miss some key technical information. My generation grows up with paper book and this new technology of ebooks is completely alien to me. I would like to thank my son Kamal for his technical support and help throughout this whole process. Thank you again son! Tagine or Tatagint is an Imazighen (Berber) earthenware pot which represents the national pride throughout the whole kingdom of Morocco; where you can find the most delicious, distinguished and well-known tagines. They are perfect for serving any type of stew because the stone retains the heat so the dish remains hot until you finish eating and are made of different materials. These cute earthenware pots are also popular in Tunisia; however; Moroccan and Tunisian tagines are two different dishes with the same name and unless you have visited both countries, it will be hard to tell the difference. 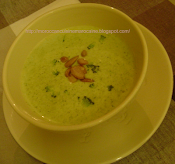 Tunisian tagines are delicious egg-based dishes which is more like the French crustless quiche or the Italian Frittata, enriched with additional meat or vegetables and served as hot or cold side dish; whereas Moroccan tagines are slow-cooked stews with either savoury or sweet flavours and served as a main dish along with bread and side dishes. I love tajines and cook that speciality on a regular basis. A perfect dish, indeed! I love ur cooking. Thanks for sharing . Thanks Rosa and Rashiqa for your comment. The lid of tajine must fit inside the base if you want the tajine to function properly, I think it would be better to return it. Mabrouk Ramdan!